It is known that peripheral vision strongly contributes to the sense of self-motion, and that users of visual displays with a narrow field of view often findit hard to experience such sensations fully. 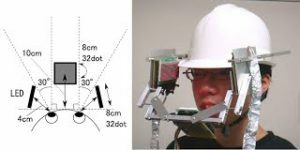 In thisresearch, we propose a peripheral display thataugments the feeling of self-motion. This consists ofsimple displays that stimulate the user’s peripheralarea of vision. 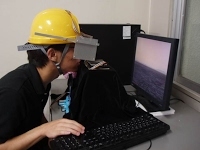 By changing the stimulus on theperipheral display, the system should be able toincrease or reduce the user’s sense of self-motion. Inthis report, we describe a prototype of the displaysystem and the result of its evaluation.